Your Philanthropy Partner Who we are. 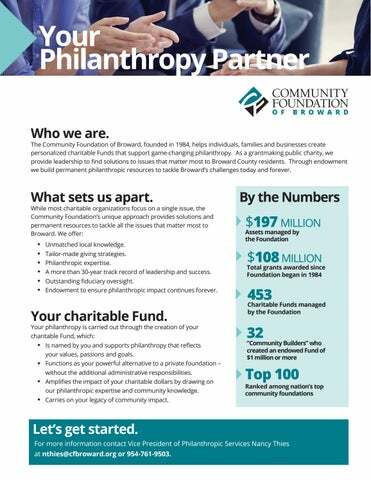 The Community Foundation of Broward, founded in 1984, helps individuals, families and businesses create personalized charitable Funds that support game-changing philanthropy. As a grantmaking public charity, we provide leadership to find solutions to issues that matter most to Broward County residents. Through endowment we build permanent philanthropic resources to tackle Broward’s challenges today and forever. Unmatched local knowledge. Tailor-made giving strategies. Philanthropic expertise. A more than 30-year track record of leadership and success. Outstanding fiduciary oversight. Endowment to ensure philanthropic impact continues forever. Your philanthropy is carried out through the creation of your charitable Fund, which: u	Is named by you and supports philanthropy that reflects your values, passions and goals. u	Functions as your powerful alternative to a private foundation – without the additional administrative responsibilities. u	Amplifies the impact of your charitable dollars by drawing on our philanthropic expertise and community knowledge. u	Carries on your legacy of community impact. Let’s get started. For more information contact Vice President of Philanthropic Services Nancy Thies at nthies@cfbroward.org or 954-761-9503. Broward’s Issues That Matter The Community Foundation of Broward has identified the 10 Issues That Matter as the greatest challenges to a brighter future for Broward. Issues that affect everyone in our community. by charitable Funds for Broward. Require bold leadership, innovative thinking and collaboration. Require permanent philanthropic resources to support long-term solutions. cancer diagnoses in Flor residents have limited acc to the latest treatments. OUR GOAL: Advance cancer research and l trials that are easily all residents. families live PAYCHECK TO PAYCHECK and remain one emergency away from financial despair. OUR GOAL: Provide a hand up and not a hand out to move struggling families from surviving to thriving. Broward is one of them. OUR GOAL: Increase the graduation rate to 90% by focusing on middle school success. 2 out of 3 adults in BROWARD are overweight or obese increasing their risk of heart disease, cancer and diabetes. OUR GOAL: Empower people to take control of their health to prevent and reverse life-threatening, weightrelated illnesses. OUR GOAL: Increase e inclusion and acceptan LGBT community ac groups and within our community. in the by next 12 years. OUR GOAL: Ensure residents age 80 and older have a safety-net that allows them to live life to the fullest. OUR GOAL: Empower all residents to make Broward a more livable and sustainable place to call home. Florida 48th in per capita spending on the arts nationally. d’s LGBT ving me e.
OUR GOAL: Ignite creativity, invoke community pride and create a sense of place through the arts that connects people to where they live and to each other. lack of critical life and soft skills puts today’s youth at a disadvantage when starting a career. OUR GOAL: Shape tomorrow’s workforce by helping young people gain critical skills to shape their lives and future careers. care each year. OUR GOAL: Ensure that Broward’s animals are treated with respect and live safely without threat of abuse or neglect. 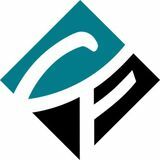 Common Giving Scenarios The Community Foundation of Broward creates personalized giving strategies, tailor-made to meet your charitable goals. Here are ways people like you, who care about our community, make a difference. Philanthropy that targets a specific issue: THE GOAL: Harold Franks wanted his philanthropy to help people suffering from cancer – the disease that targeted his wife, Dorothy. THE SOLUTION: Harold established a charitable Fund for Broward dedicated to cancer research and help for cancer patients. THE RESULTS: Grants from the Harold D. Franks Cancer Fund pay for innovative cancerfighting efforts such as molecular testing – an advancement Harold couldn’t have anticipated during his lifetime. Harold’s grants also support organizations that aid cancer patients, including Gilda’s Club South Florida and the Joe DiMaggio Children’s Hospital Foundation. Philanthropy that tackles many community issues: THE GOAL: Everett Metcalf wanted his philanthropy to address as many community needs as possible, including children’s programs, community revitalization and help for the arts. THE SOLUTION: Everett established a charitable Fund for Broward to allow for the most flexibility in grantmaking. This type of giving enables philanthropists like Everett to help where it’s needed the most and provide resources that can respond to changing community needs. THE RESULTS: Grants from the Everett H. Metcalf, Jr. Unrestricted Fund pay for wide-ranging programs that: put young people on the path to careers, increase opportunities and job stability for workers, foster healthier living, support a vibrant arts scene and make our environment more sustainable. Philanthropy through a donor-advised Fund: THE GOAL: Jacqueline Niehaus wanted her philanthropy to help young people – and she wanted to help pick the programs and organizations that benefit from her giving. THE SOLUTION: Jacqueline established a donor-advised Fund for Broward at the Community Foundation. With a donor-advised Fund, Jacqueline makes recommendations about which community groups and projects should receive grants from her Fund. The Foundation’s philanthropic experts vet those options, share ideas she hasn’t considered and use Jacqueline’s direction to guide grantmaking. THE RESULTS: Grants from the Jacqueline and Robert J. Niehaus Charitable Fund help at-risk youth learn to play musical instruments to foster creativity through the arts. Jacqueline’s Fund also supports education programs that give young people the building blocks to become entrepreneurs. Published February 2019.